Is there the best way to find a sub-tree in a self-referencing table? Experts Exchange > Articles > Is there the best way to find a sub-tree in a self-referencing table? Graph theory is omnipresent in computing and graph structures are very often used to model and solve problems. But despite being so theoretically common, graphs very often prove to be problematic. Not because they are inherently difficult, but seem so, because they are neglected and avoided whenever possible. Just look how often here on EE people ask questions about tree operations on database level. It is true that for many years it was hard to implement common tree functions in relational database systems but in 2005 MS SQL Server implemented Common Table Expressions (defined by SQL:1999 standard) which made truly recursive queries possible. In that same version XML data type has been added and later in version 2008 HierarchyId data type emerged, designed especially to make operations on trees easier. Nowadays Transact-SQL gives us plenty of tools to deal with data structured as trees: sub-queries, recursive stored procedures, cursors, XML data type, temporary tables, CTE, HierarchyId data type; thus the only problem remaining is to pick the right one. - nodeValue - in real life scenario it could be a foreign key to data table or instead of that many columns could be used storing record information. In total there are 69632 nodes with one root and 14 nodes at first level. 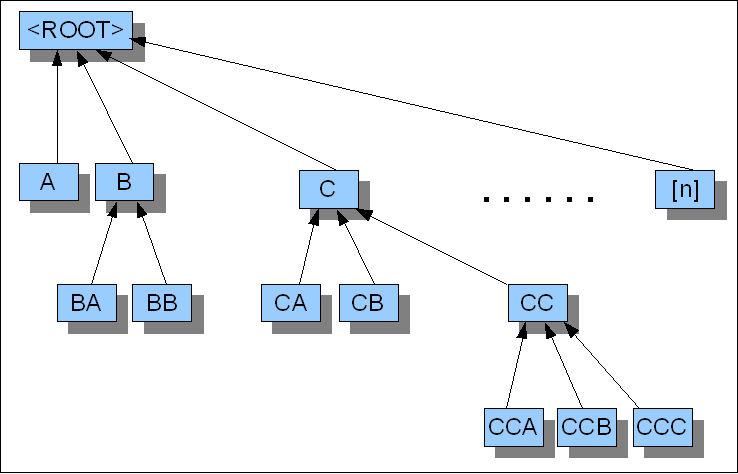 Sub-trees staring from those 14 node have different depths and sizes and on each level there is different number of nodes. Finally an index is created on the nodeParent column to improve performance. The test environment is ready. Now is time to present possible solutions. Line 16: In a loop for most recently added records to the temporary table search for their 1 level descendants and add them to the temporary table. Already at this point one advantage of CTE over Loop is visible - the clarity of code. NOTE: because such CTE is treated as single query I was able use an inline table-valued function to make the code even clearer. This time we need to have two functions. One that will be called recursively and will return XML. And than another one that will use the XML data and return table with results. It is not that obvious how a HierarchyId column works but explaining it's mechanics is beyond the scope of this article. If you have never used it before, don't worry. For this Article, we just want to see its practical benefits in action. However if you are interested please check references at the bottom of this article where you will find links to sites explaining it. 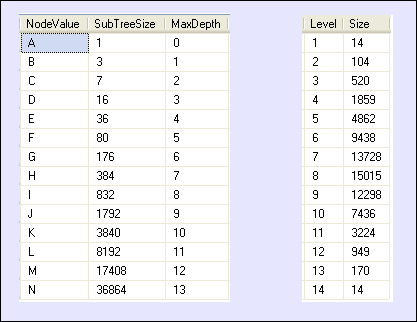 Firstly we will have to add a new column to the Nodes table and compute it's values for all existing rows. The initial query is time consuming - took my poor laptop over 2 hours - but it is only due to the fact that the table was not designed to use HierarchyId from the very beginning and now the existing structure has to be translated into a new construct. That translation is the first script. Once the table has been converted write operations on it will have only a very little, negligible overhead as a trade-off for performance at read time. -- DBCC FREEPROCCACHE can impact performance on your Production Servers. -- It is used here on a Test Machine to generate the results so we can compare fairly. but plan for function using CTE is completely different. But these are only estimated execution plans, and yet to be "put to the test". and computed sub-tree count for each one of them 15 times with each of 4 functions. For each node and function I recorded the average server's CPU time needed to process the request. As you may see there wasn't much difference until around 1500 nodes. Beyond that point XML version's time goes through the roof and for that reason I excluded it from further computation of relative values. From this graph you may clearly see that the old school Loop solution can still compete with the two more modern approaches as its relative performance to the others is stable regardless of the sub-tree size. More so, it seems to be exactly in the middle between the two. You may also see that CTE based solution seems to be fastest for small trees and HierarchyId for large ones with transition point around 1500 nodes and 8 levels. But you must not forget that in this test scenario depth grows with size as well, and in business scenarios we typically have only few levels. So let's see how the performance compares for sub-trees of different sizes but equal depths. It is worth noticing all the solutions have almost linear relation between size and time. Again XML method despite looking all right with small sub-trees goes through the roof at the other and of the graph. And again for that reason I excluded it from further computation of relative values. Here you may clearly see that time-wise, out of the three CTE approach is the worst yet we are talking about 0.2-0.3 second difference to the best option at any size so it still may be preferable solution due to it's clean and compact syntax. And how about Loop vs. HierarchyId? On free level sub-trees their performance is very close. with Loop having small advantage for sub-trees up to around 2500 nodes and HierarchyId on bigger ones. So is the overhead worth implementing HierarchyId? On such shallow trees probably not, but when you look at previous graphs it looks like the new type has a lot to offer when it comes to much deeper structures.